Apothecary Graphic's contrasting chevron checkerboard pattern zig-zags in the background, creating strong visual appeal. The effect is mesmerizing in its symmetry, drawing your eye to the center where a white overlay framed by thin black lines spotlights your text. When space allows, a white decorative plaque shape frames your text in a way that's both modern and ornamental. Your words will look striking printed in black ink in a bold distinctive font with strong thick/thin strokes and gracefully arching serifs. Apothecary Graphic is dynamic but crisp and clean, achieving the perfect balance of dark and light, movement and calm. Highly versatile, Apothecary Graphic is part of a family of styles that share some design elements (like the red rubber stamp-like angled text) and a palette of 28 beautiful colors. You can use it by itself or mix and match with Apothecary Neat or Deluxe versions for a varied but visually coordinated look. 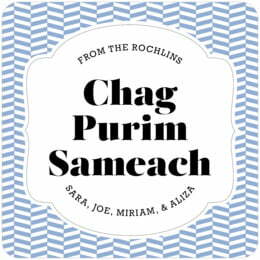 Customize your Apothecary Graphic purim coasters today! Apothecary Graphic Purim coasters are available in multiple shapes—3.9" round, or 3.9" square with rounded corners, and others. They are created on extra-thick 58-point paper board. To give you an idea of how thick they are, a bundle of twelve coasters is about 3/4" tall. They are made of absorbent pulpboard to help protect your tabletops. The Purim coaster surface is finished with a smooth matte coating to provide a beautiful, crisp printing. Purim coasters are individually die-cut, so their top edge is soft and curved. They are designed to be disposable, but they are durable and can be reused. If unused, they can be set aside as keepsakes and will last forever. Purim coasters are printed on one side only. On the blank back, a small Evermine logo is tastefully debossed (not printed with ink, but simply pressed into the soft pulpboard paper). Apothecary Graphic Purim coasters come beautifully packaged in boxed sets of a dozen. 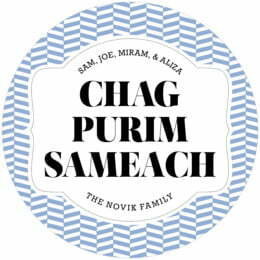 Choose the "Personalize" button to begin customizing your Apothecary Graphic Purim coasters today.